I am a man with many obsessions. Unfortunately, in most cases they are merely half-arsed obsessions, mild over attentiveness that is generally seen as being between slightly worrying and worthy of medical attention. However, one of them that tips just over into the “he’s actually putting some effort into that, best leave him alone” is sandwiches. Now, I’m not a creator of multilayered gastronomic delights with interesting viands, a selection of exotic salad fronds and home made sauces to hold the whole mess together. I sit more on the “I can’t be bothered with cutlery, how can I best get this thing I like into my mouth without needing to wash my hands afterwards” side of the sandwich creating fence. To give an example – this week I put lettuce in a sandwich for the first time. The same sandwich also contained mayonnaise, another first for me (unless you include tuna where it is a key ingredient in converting the fish into a building material), but as it was mixed with English mustard I feel it was allowable, if not excellent evidence of the middle class nature of my sandwich making existence. However, there is one sandwich (non-toasted – the toasted sandwich is an entirely different beast) that I am particularly obsessed with, and after a small discussion on Twitter this week I have felt compelled to a) write about it and b) use the excuse of writing as justification to make and eat one. The item in question is the Fish Finger Sandwich. It is a strange sandwich which I assumed was unique to me and a group of pre-teen school friends, but in recent years it has become a mainstay of gastro-pub menus, afflicted with ciabatta and tartare sauce. My take on the sandwich is much simpler, but with two non-canonical and occasionally controversial elements. The first of these is cheese. Now, this is the least difficult to accept of the additional components, with the McDonald’s McFish/Filet o’Fish/Fish-wich/whatever existing as an unpopular but well known piece of prior art, but there are those who blanche at this first step away from the pure. To them I say but this – cheese makes all food better, get over it. I am, as is fairly obvious within a short while of speaking to me, a perfect example of private schooling in the UK. I went to boarding school between the ages of 11 and 18 and it made me the man I am today – fond of yoghurt, good at sleeping in company and enamoured by young biology teachers with long dark hair and a penchant for a rugby. However, in my formative years at prep-school certain food related habits forced themselves onto me – the aforementioned fondness for yoghurt1, a tolerance for Sunblest white bread and red flavoured jam, and a need to combine fish fingers with Marmite. While the yoghurt was pretty good (mainly black cherry), much of the other fare we were presented with was less than appetising2, with no meal being quite so demoralising as breakfast. This was far beyond the days when all boarders were forced to sit down on Saturday mornings to write letters home, full of euphemism so as to avoid the brutal hand of censorship, so there was little fear of parents hearing about the bleakness of breakfast. This was especially true as they filled us with Club biscuits and E110 laden orange squash at 3pm every day and there was an unspoken feeling that this was buying our silence. Breakfast had a few configurations involving fried animal remains and precursors, fried bread products3, yoghurt and, the most feared, fish fingers. Fish fingers when cooked en masse, allowed to cool and then reheated in an oven become quiet a strange beast – blackened on the outside, just cooked on the inside, devoid of moisture and with the texture of stiff cardboard. However, being growing animals we needed all the food we could get and needed to find coping strategies for not only being able to ingest the fish fingers without incident but also to digest them afterwards. The first stage was one loved by chefs the world over – butter. We would steal butter dishes from other tables and then soak our fish fingers in fat until such time as they softened enough to be cut with an institutional knife. However, this led to a further problem – they tasted of low quality, slightly rancid butter. It was at this point that Marmite came into play – strongly flavoured and able to mask the various evils, as well as full of the vitamins and minerals and growing child requires. We didn’t come to Marmite without experimentation, but red flavoured jam and Heinz Sandwich Spread4 were quickly discarded as being unsuitable. From thence my love of Marmite and fish fingers arose, with the addition of cheese happening due to the aforementioned making of everything better, especially when Marmite is involved. 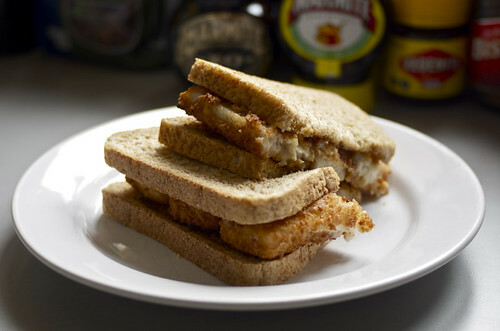 The fish finger sandwich still remains at the core of my guilty comfort foods, as the packs of fish fingers sat in my freezer5 at almost all times will attest, but the addition of Marmite adds more than just fond memories – it also means noone’s going to pinch my sandwich. 1I held the school record for the amount of yoghurt eaten at lunchtime from age 10 until I left at 13 – 11 bowls. The entire dining room watched as I repeatedly returned for ‘seconds’ with the kitchen staff’s bemusement eventually turning into focused looks of challenge. I like to think that the deputy head opened a book on the final number and hope that Tom White, irreverent games teacher of the good kind, cleaned out his colleagues due to his faith in my eating ability and my ridiculously overactive fat child appetite. I suspect that in reality my showboating and eventual need of assistance to leave the dining hall were all beneath their notice and the adulation of my peers was all I got. I still like yoghurt. 2The situation changed shortly after I left when a new regime of school food was brought in. It had the ‘jolly’ name of Capers and was run by a smiling man called Julian. He was also my brother’s dance instructor outside of school. I heard there were vegetables involved. I don’t think I would have liked it. 3The amount of oil a single slice of Sunblest white bread can soak up is incredible. 4Every table at lunch and dinner was supplied with a jar of Sandwich Spread. Noone ate it, other than by a dare, apart from the Headmaster. Occasionally he would ‘take’ breakfast or tea, sitting at the head of the table nearest the door, and would happily force down numerous pieces of bread spread thinly with the stuff, and for this reason alone it sat on each table, ready for use as a punishment device by the bigger kids. 5I normally buy the cheapest fish fingers I can, as they are merely an aid to delivering cheese and Marmite into my body with a dose of nostalgia, but my latest shopping delivery substituted my breaded white fish bits with huge rafts of cod covered in Real Breadcrumbs(tm). They don’t feel right, are large enough that I can only fit 3 onto a slice of bread (with significant overhang) and they need to be arranged perpendicular to my normal arrangement. They look like small floorboards. They scare me. Posted: July 14th, 2012 under blog. Once a week their ‘hot special’ is a baguette, opened out and toasted in the sandwich toaster thingy (which makes it quite flat). Fishfingers are re-heated in the microwave, and then en-sandwiched with copious tartar sauce and a salad garnish. Is very tasty. Plus, ordering something called a ‘hot special’ sounds vaguely dirty.